"Soon after the Germans located at Schoharie, they formed a church, and had preaching…” (Jeptha Simms, History of Schoharie County and Border Wars, 1845, p. 610). The first two preachers were itinerants, one Dutch Reformed, and one Lutheran; they served until 1717. Several other ministers served Schoharie, but one, Johann Bernard Von Duhren, or Van Dieren (1722-28), proved to be a fraud. It appears that there was friction between the German Lutherans and the Dutch Reformed, and by 1742 there were two congregations in Schoharie: Lutheran and Dutch Reformed. In 1742, Rev. Peter Nicklas Sommer arrived from Hamburg to serve the Lutheran Church, having received a call to come to serve the Palatine Lutherans in Schoharie. Dominie Sommers married Maria Kayser of Stone Arabia, and besides preaching in Schoharie, he served as pastor to congregations in Stone Arabia, Little Falls, Geisenberg (Hallsville, near Fort Plain), Rhinebeck, Claverack, East Camp and West Camp, in the Helderbergs, Dorlach (Sharon), and Cobleskill. These locations are in what are now Columbia, Dutchess, Albany, Green, Ulster, Herkimer, Schoharie, and Fulton Counties—a very large area! Many of these places were visited only two or three times a year, when he would perform baptisms, marriages, and funerals. He retired at age 80, and died in 1795, aged 86. According to the New York State historical marker in front of the church, “the first school” was on this site, and the date on the sign is 1740. No further information could be found relating to this school. It is likely that the building was burned when the British attacked the valley during the American Revolution. The old stone church (not to be confused with the “Old Stone Fort,” which was built as a Dutch Reformed Church) and the old parsonage survived, probably because they were not seen by the raiders, or because Sir John Johnson, the commander of the raiding force, had given orders that church buildings should not be burned. Incorporated into the twenty-inch-thick outer walls of the church building is a heavy timber framework, the members of which extend around the building both below and above the window openings. (These became visible when the lath and plaster were removed following the 2011 flood.) No vertical timbers were used. This framework helps to tie the walls together and give them resiliency. The roof is supported by the original heavy wooden trusses hewn from selected oak timbers and mortised together using methods used in Europe in the sixteenth and seventeenth centuries. These trusses were not properly designed to carry the heavy slate roof, and the roof structure had to be reconstructed around 1959. The total original cost of the building was $5,450.77, besides donated materials and labor. The original church spire was assembled in the tower room and raised vertically to the top of the tower. The interior arrangement of the sanctuary has been reoriented and changed several times.The present brick church building is one of the oldest church buildings in Schoharie County that is, and has continuously been, used as a house of worship, and the manse has served as the minister’s residence since it (the manse) was built in 1801. The present manse was built around 1801, and the sexton and cemetery caretaker used the old parsonage as a dwelling. The Presbyterian congregation voted to convey the ownership of the old parsonage to the Village of Schoharie in 1961, with the understanding that the Schoharie Colonial Heritage Association would restore it. It was restored to its original 1743 appearance, and it is open to the public as a living museum during the warmer months. In addition, the church owns St. Paul’s Cemetery, which is still an active cemetery. In 1920, the Lutheran and Methodist churches joined, forming the Community Church of Schoharie, Inc. Worship services were held in the Lutheran edifice, and the Methodist Church building was used for Sunday School and as a church hall. The Methodist building stood across from Prospect Street, and was razed in 1964, when the present Christian Education Building was built. The Meneely bell from the old Methodist church was placed between the present sanctuary and the education building. In 1960, the congregation voted to affiliate with the Presbyterian denomination. There was some sentiment that becoming Methodist or Lutheran would cause division in the congregation, and the moderator for the denominational choice meetings was Presbyterian. In addition, curriculum from the Presbyterian denomination had been in use in the Sunday School, and the congregation apparently found it sound and effective. A Jordine organ replaced the original organ in 1881. The Jordine organ was electrified, and new pipes were added in 1956. The organ was restored 1996-1999, and the console is currently being refurbished. Schoharie United Presbyterian Church has served and continues to serve the community in many ways. It has allowed the use of its buildings to community organizations, including overflow classrooms from Schoharie Central School, Head Start, and Youth as Leaders. In addition, it has housed and organized the local food pantry, which was back up and running only a few weeks after Hurricane Irene. “Helping Hands” concerts, which benefited various organizations in the county, were held in the sanctuary for a number of years, several years ago. The church’s mission fund has contributed to many causes, both local and worldwide, and several church groups have participated in mission trips. In partnership with the Schoharie Reformed Church, the Middleburgh Reformed Church, and Camp Fowler, a very successful community day camp program has served over one hundred county children and youth each summer. The 2011 flood, caused by heavy rains from Hurricane Irene, brought over five feet of muddy water coursing through all three church buildings. Many buildings in the community suffered the same kind of damage that the church buildings sustained. Mud and debris needed to be removed, floors and walls had to be torn out, and furnaces and electrical systems needed to be replaced. The efforts of many, many volunteers from the community and elsewhere have helped immeasurably in the recovery of the village and nearby locations that were similarly affected. At the time of this writing, the recovery efforts have reached a point where the light at the end of the tunnel can be clearly seen, yet there is still much to be done to restore the church and the Schoharie Valley, but with great hope and community spirit this work will be done. 1700s. The history of Schoharie United Presbyterian Church parallels closely the history of the town of Schoharie and, indeed, the entire region. Our story begins with the first Palatines settling at “Fountain Village,” so called because of the many springs found there. These Palatines were Lutherans, and in those days, it was the Lutheran custom for a layman to conduct religious services and read a sermon from an approved collection in the absence of a minister. The Palatines worshiped in this way for over 30 years before Rev. Peter Sommer became the first pastor of St. Paul’s Evangelical Lutheran Church. 1711 – Palatines arrive in Schoharie as the first white settlers. 1731 – Rev. Willem Berkenmeyer, serving in Albany and Athens, visits Schoharie from time to time, preaching and administering the sacraments. 1734 – Rev. Berkenmeyer reports that worship in Schoharie is being held in a “Schuur ” (barn-like building). May 1743 – Rev. Peter Nicolas Sommer becomes the first pastor of St. Paul’s Evangelical Lutheran Church in Schoharie. 1743 – The parsonage is built. Worship is held in the lower portion of the building (which still stands, and is known as the Palatine House, the oldest building in the county). July 1743 – Communion is held for the first time; 200 communicants were present. 1751 – The Old Stone Church is finished and consecrated in May. It was located in what is now the Lutheran Cemetery. 1789 – Rev. Sommer retires at the age of 80. He died in 1795. 1795 – Old Stone Church is torn down, and its foundation stones preserved and moved. Rev. Sommer dies at age 86. 1800s. As the congregation approached the 19th century, plans for a new church were made and the Red Brick Church on Main Street was built. Over the century to come, the church would be home to several different pastors, and many changes were made to the church over time. 1795-96 – Rev. Dr. Frederick H. Quitman becomes pastor. The Red Brick Church is built using foundation stones from the Old Stone Church. According to local tradition, the new church was built on the site of the first school in Schoharie (built in 1740). 1799 – Pastor Braun is recalled for three years. 1800 – Original bell is installed in present bell tower. 1805 – Rev. Augustus Wackerhagen is installed as pastor. The manse on Main Street was built in 1801 for him. 1819 – George James Lintner, DD becomes pastor. 1836 – Extensive changes are made to the church building, including windows in the east and west walls, a gallery erected along the east and south walls, and doorways cut through the south wall on either side of the bell tower. 1850 – James R. Keiser becomes pastor. 1857 – Rev. Edmund Belfour is ordained in the church. He was instrumental in getting eight saloons in town to close. 1868 – Jacob H. Heck becomes pastor. 1881 – Pew doors are removed, central heating installed, and the original organ is replaced. 1882 – Edwin Heyl Delk becomes pastor. 1886 – Charles Edward Keller becomes pastor. 1890 – Laurent D. Wells becomes pastor. 1896 – Stained glass windows replace the old-fashioned square window panes. Rounded pews and a Gothic entrance are installed. 1898 – G.D. Dell becomes pastor. 1900s. The 1900s saw drastic changes in the way the church identified itself, as it combined with other churches during World War I, and later became a Community Church. In 1960 the church voted to adopt the Presbyterian denomination, and in the 1960s-90s was part of a yoked parish with several other area towns. 1903 – Charles Karg becomes pastor. 1917 – Electric lights are installed. 1918 – George Becker is installed as pastor. Schoharie’s three Protestant churches, the Lutheran, the Methodist and the Reformed, unite in a “federation,” in which each would keep its identity, for the duration of World War I. 1920 – A. V. Patton is installed as pastor. 1920 – Community Church of Schoharie, Inc. is established, joining the members of the Lutheran and Methodist churches. The Methodist church building was used as a fellowship hall and Sunday School building until it was razed around 1960. The Meneely bell from the Methodist Church belfry is mounted in front of the present Christian Education Building. 1924 – J.H. McConnell Becomes pastor. 1932 – George Kyle becomes pastor. 1940 – Interior repairs and redecorations are made to the church, and the large chandelier is removed. 1946 – Walter B. Jerge becomes pastor. 1956 – George Doherty becomes pastor. 1960 – The congregation votes to adopt the Presbyterian denomination. Thomas Hedges becomes pastor. 1961 – The congregation votes to convey the Palatine House to the Schoharie Colonial Heritage Association. 1964 – The Christian Education Building is built and dedicated. 1966 – The congregation votes to merge with the Esperance Church as part of the Larger Parish program. The Larger Parish consists of five churches: Breakabeen, Carlisle, Esperance, North Blenheim and Schoharie. 1975 – Church youth group travels to Scotland. 1978 – There is a fire in the sanctuary; renovations and redecorating follow. 1983 – Presbytery approves the dissolution of the yoked relationship between Carlisle and Esperance and Schoharie. 1986 – Church youth group helps with flood cleanup in West Virginia. 1987 – Church youth group travels to Florida to help with a Habitat for Humanity project. Richard Frazier becomes interim pastor. 1997 – Presbytery approves dissolution of the yoked relationship between the Breakabeen-North Blenheim Church and Schoharie. 1999 – Organ restoration completed and church carillon replaced. 2000 – Richard Hill installed as pastor. 2010 – Rev. Bebb Wheeler Stone becomes interim pastor. Aug. 28, 2011 – Hurricane Irene strikes, causing floods that sent five to six feet of water into the sanctuary, manse and Christian Education Building. Aug. 29, 2011 – The recovery begins. Feb. 16, 2014 -- Rev. Brandan Scott Eddy begins as Pastor. May 28, 2016 -- Schoharie Presbyterian partners with Schoharie Reformed, Schoharie Lutheran, and Schoharie Promotional Asscociation to dedicate Church Labyrinth Reflection Area to launch the Schoharie Lilly Park. Sept. 2016 -- SUPC partners with Schoharie Reformed to launch the Christian After-School Program as a community outreach ministry. 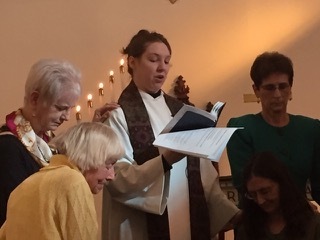 Nov. 20 2017 -- Andrea Joy Holroyd appointed Temporary Parish Leader for SUPC and Carlisle Presbyterian Church.